Among the most ephemeral of all Johnson Maps, appearing in just one edition of his atlas. Johnson's New Military Map of the United States showing the Forts, Military Posts & all the Military Divisions with Enlarged Plans of Southern Harbors. A scarce and underappreciated 1861 map by A. J. Johnson showing the military deportment of the United States in 1860, just prior to the outbreak of the American Civil War. The map covers the entire United States and is broken up into various military departments. The map is surrounded on two sides by inset plans of 'southern harbors.' Though the Civil War had not yet broken out when Johnson drew this map, tensions where high and his choice to include strategic southern within his 'Military Map' was clearly intended profit from a general sense of anticipation. Insets include, from top right, Baltimore, Washington and Vicinity, Hampton Roads, Charleston Harbor, the Savannah River, Key West, Pensacola Bay, Mobile Bay, and New Orleans. The military department system in the United States has a long and complex history. The department system was created by Secretary of War John C. Calhoun and Jefferson Davis in 1853. The present map references various changes to the department system at the outset of the American Civil War. When the war began there were but three military departments dating, most of which were organized for the Indian Wars. These included the Department of the east, the Department of the West, and the Department of the Pacific. The Department of the east was created in 1853 and initially constituted all of the lands east of the Mississippi River. In 1861 this department was broken into various subdistricts including the Department of Florida, the Department of the Potomac, and the Department of the South, among others. The Department of the West extended from the Mississippi to Texas and the Arkansas River, thence westward as far as the Rocky Mountains, and northward to Canada. This department was disbanded in November of 1861. Just before this map was made, the Department of the Pacific was sectioned into the Department of California, the Department of Oregon, and the Department of New Mexico. Within the first year of the Civil War, this primitive department structure was completely reimaged with numerous smaller departments ranging from the Department of the Potomac to the Department of Key West supplementing the more archaic large department system. Unlike most Johnson maps, this map is a fully independent production and was not inherited from the earlier work of Colton, nor was it included in the first edition (1860) of Johnson's Family Atlas. The map appeared in the second Johnson and Browning edition, 1861; though it is not assigned a page number nor does it appear in the general index of the Family Atlas. Most likely Johnson ordered this map drawn to capitalize on increased interest in the military deportment of the United States on the eve of the Civil War. This map was exceptionally ephemeral, reflecting the changing nature of the department system itself - the present example being the only issue to reflect a 7 department system. 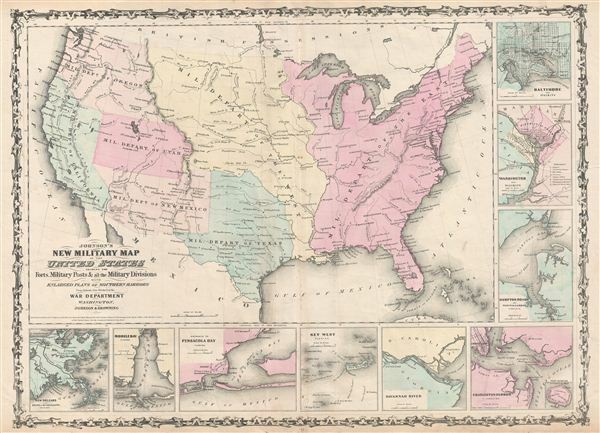 He later reissued the map with various completely new plates and 18 departments through 1863, before abandoning the concept entirely in favor of a state focused presentation. Johnson issued this map in the 1861 edition of his New Illustrated (Steel Plate) Family Atlas. This was the last edition of the Family Atlas to bear the 'Johnson and Browning' imprint. Johnson, A. J., Johnson's New Illustrated (Steel Plate) Family Atlas of The World with Physical Geography, and with Descriptions Geographical, Statistical, and Historic including The Latest Federal Census, A Geographical Index, and a Chronological History of the Civil War in America, (New York) 1861. Johnson's New Illustrated Family Atlas was produced in numerous editions from about 1860 to 1887. Johnson's first atlas was mostly likely the 1859 edition of Colton's General Atlas which both aesthetically and comprehensively very similar to the 1860 first edition of the New Illustrated Family Atlas. Johnson's atlas was noteworthy in its day as one of the few commercially produced American atlases that could compete with more established European Atlases. Although he called the atlas 'Steel Plate' on the title page for marketing purposes, Johnson in fact incorporated modern lithographic printing techniques and lower quality woven wood pulp paper to economically produce large format maps in quantity. He also began publishing the New Illustrated Family Atlas on the cusp of the American Civil War, a decision that proved fortuitous, as the war corresponded to a general increased interested in cartography. For the most part, Johnson's Atlas was sold by subscription; nonetheless it became so popular that for at time he was considered the largest publisher in the world. Other than the first edition, the atlas itself has no true editions. Rather, Johnson incorporated updated maps as they became available, so each example of the Johnson atlas might well contain unexpected and scarce individual maps. Johnson's map of the American Southwest, for example, appeared in more than 17 different states, each illustrating minor variations to the rapidly chasing geography of that region. Moreover, Johnson's offered a service whereby he would mail updated map pages that could be tipped into older atlases to keep them current. Generally speaking, Johnson's atlas was issued in four periods - each defined by a distinctive decorative border. The earliest edition featured a strapwork border that appears as rolled and decoratively cut leather. This borderwork remained in use until 1863. In 1864 Johnson started using an updated fretwork or grillwork border that resembles worked iron - as in a decorative fence. This border was in use from 1863 to 1869. The 1863 edition of Johnson's atlas used both borders and is considered transitional. From 1870 to 1882, Johnson introduced a new border that featured elaborate Spirograph style geometric designs, which was used from 1870 to 1882. After 1880 a new border different but aesthetically similar to the Spirograph border began appearing. Certain editions of the atlas issued from 1880 - 1882 were transitional. Very good. Original centerfold exhibits some wear and toning. Minor soiling to margins.